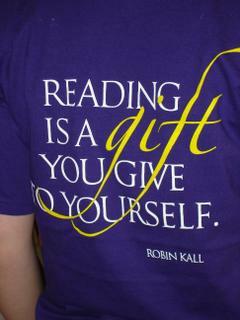 Just Thinking....: "Reading is a gift you give to yourself"
Who said these immortal words? Give up? I did...only I didn't realize that they'd go anywhere besides the article for which I was being interviewed. Well, it turns out that once it's "out there" it's out there! I was contacted over the summer by someone representing a the C.H. Booth in Newtown, CT asking if they could use the quote for shirts they were printing to celebrate their 30th year. At first I thought it was some kind of joke, but then I remembered the article and expressing that sentiment and it's true. Reading is something that we do only for ourselves. (okay, unless it's a school assignment! )To say that I was flattered would be an understatement. I gave them the go-ahead with the request that I receive a shirt as a keepsake. The shirt arrived and it was so cool to see my words up in...well, not lights - but close! The shirts are deep purple (my favorite color!) and on the back ...my words! I just LOVE it! I mentioned this on-air when the shirt arrived and have received a few requests for the shirts. I have spoken with the lovely woman in charge, Mary, and she says there are still some available which they are selling to raise money for the library. If anyone would like one they are $14. 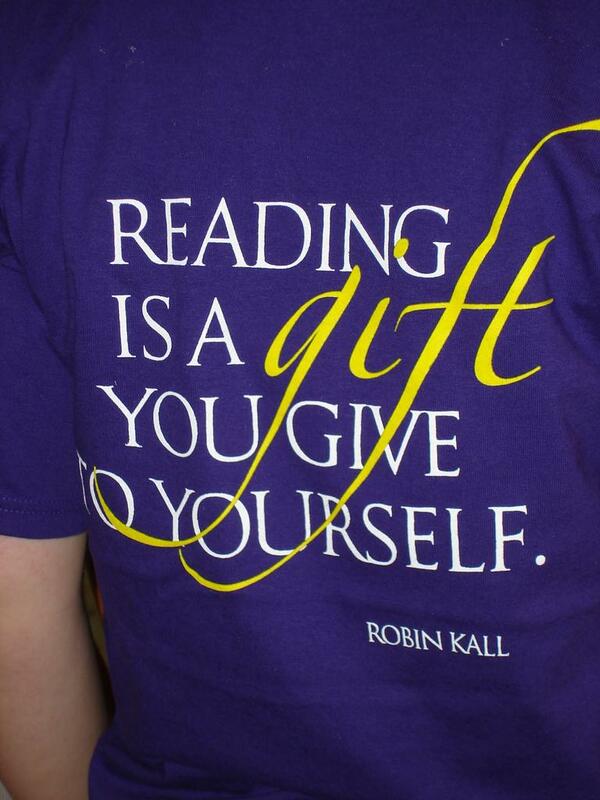 Just send me an email at robin@readingwithrobin.com and I'll get you the info! Every single time I wear my shirt, someone comes up to me and says, "I love that!" or, "What a great quote." or, "Where did you get that shirt?!" It's a big hit with everyone. August 2004 Splash into Summer RWR!